Embroiderers' Association of Canada, Inc.: Spring is on it's Way! Today is the Ides of March and we don’t need to fear - let's celebrate the middle of March and do some stash-busting. Can you see spring in the distance? Kathrin Ellison is once again allowing us to link to her posts. This time we are featuring a 15-sided biscornu project. Kathrin has a supply list in the first project post and in subsequent posts she shares photos of each completed side and links to downloadable patterns. Take a look through all of the project posts to see some of the alternate colour options. I know that I have enough supplies in my stash to make at least one of these! 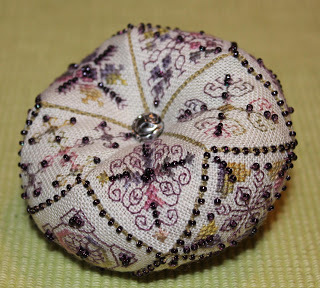 This looks like a nice, carry along project but I know I'll be doing the beading at home! Thank you to Kathrin of Gitta's Charted Petit Point for allowing us to share this resource with EAC blog readers. What a wonderful project! Thank you and Kathy for sharing this with everyone!